Wow, what a read! I've had Bitterblue sitting on my shelf since it came out, but I was afraid to start it. I was worried that it wouldn't live up to its two predecessors, Graceling (read my review here) and Fire (read my review here). Finally, I decided to shelve my fears and jump right into Bitterblue. I don't often do this, but sometimes, especially if it's been a while since I read the previous books, I will re-read the first books in a series before a big release. 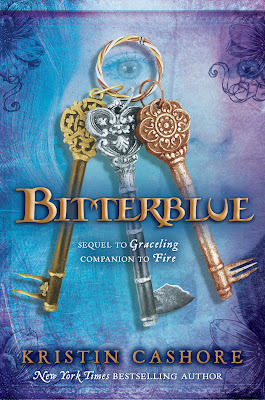 I really, really wish I had re-read Graceling and Fire before reading Bitterblue. I think I would have enjoyed Bitterblue even more if the events of the first two books were fresh on my mind. I read my reviews of the first two books (which are woefully inadequate as they were some of the first reviews I ever wrote ) as well as the summaries of the books to refresh my memory. That helped some; however, the backstory Cashore provides in Bitterblue shed the most light on the events leading up to Bitterblue's reign as Queen of Monsea. While waiting for Bitterblue's release, I often wondered what in the world could be taking Cashore so long to write this book. Well, now I think I know why the publication date kept being pushed back. I could tell that Cashore did a ton of research, especially on ciphers, and that extra information added a nice layer of depth to the story. I loved the illustrations, thought they were beautiful, and loved seeing a visual representation of Ashen's embroidery. The plot moved quickly, and all of my favorite characters from the first two books were back in Bitterblue. I loved that! I loved getting to see Katsa and Po again, as well as Fire too. The love story was so sweet and appropriate. I loved how Cashore wrapped things up in that regard: it was so believable and realistic. Not necessarily a happily ever after, but it really fit the story. My one complaint about Bitterblue is that the ending left quite a few things open-ended. I still have quite a few questions after finishing the book. Questions like, what will happen when Po starts revealing his Grace to everyone? Will Katsa and Po ever get married or have children? Will she reveal the true reason why they have not conceived a child as of yet? What will become of Giddon? Will Bitterblue end up with him? (I kind of think she will.) What will become of Monsea once Bitterblue's changes are in effect? And how will the Dells figure into all of this? All of these issues make me wonder if there is going to be another Seven Realms novel. I sure hope so---I'd happily spend my money to read more from Kristin Cashore! Your last paragraph was liked zapped out of my head - I want those questions answered too!! Will keep in mind to re-read before I pick this one up. I've been really looking forward to it, and it sounds like it won't disappoint except for maybe the ending.